Intelisecure | Secure Your SNMP!! 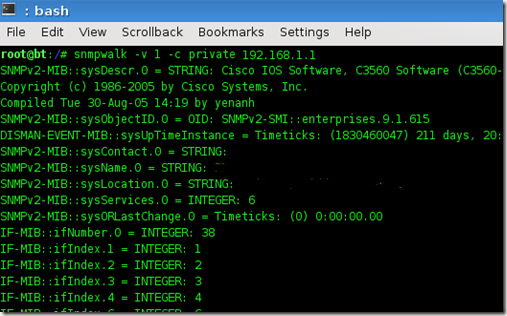 In this post, I’m going to briefly discuss some of the age-old security issues identified with SNMP configurations, specifically on Cisco IOS network devices. .
SNMP Default Community Strings – Never ever use them. Most SNMP devices will default to public for read-only access and private for read-write access. Even if nothing else is done to the SNMP configuration change these values to something strong….throw in lower case, upper case, special characters and make them long!! SNMP Permissions – If, for network monitoring purposes, you only need to poll SNMP values on your network device then completely disable any read-write access; it’s not needed and should only be enabled if you are making configuration changes to the device. Cisco IOS configuration snippet #2 Same as above, just don’t bother using this either. Allows full read-write access using the equally common private string. SNMP Access Filters/Lists – Making sure only legitimate management devices/hosts can access your SNMP-enabled devices is good practice. Assuming a strong SNMP community string has now been chosen and configured, its worth locking-down the devices to only those devices that need SNMP access. 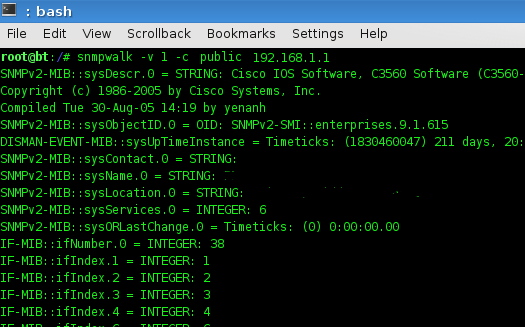 “sysName” is represented as “.1.3.6.1.2.1.1.5.0”. I’ll use the SNMPSet command to change this value to “PENTURA”. In the command example below, the “s” instructs SNMPSet that I want to write a string value. So that confirms private is a read-write community string. Now I can go ahead and extract the IOS configuration. I start my TFTP server and, using the SNMPSet command, configure the router to upload its configuration to an IP address I specify.